Mike’s away at Tales of the Cocktail, and I’m once again left to my own devices when it comes to dinner. I’ve had a bit of food-related “homework” to attend to, in preparation for a couple of things I’ll get to tell you more about soon, but aside from that, my main goal is to work through the rather excessive amount of gorgeous summer produce I brought home from the farmers’ market last weekend. Like tomatoes, for instance. I’ll admit that the best tomatoes of the season are still a little way off, but I can’t resist loading up on the lovely local gems I’ve encountered at the markets in both Boston and in Providence. I slowly cooked these ones in a bit of olive oil with just a pinch of salt, splashing water in from time to time, gently crushing them as they softened and got almost syrupy sweet, and finally pressing them through a strainer to remove any skins and seeds, leaving behind a rich, jammy tomato reduction. 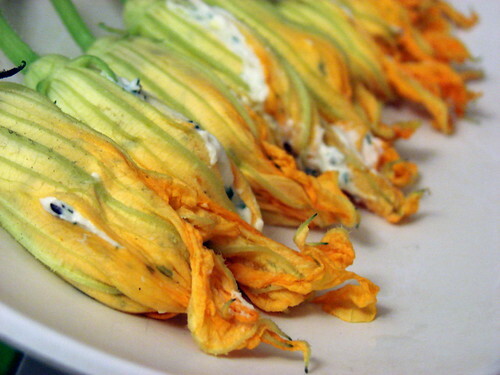 I stuffed my cleaned squash blossoms with my usual mixture of fresh ricotta, soft chevre, salt, lemon zest, and a good amount of finely chopped fresh herbs – in this case parsley, basil from the patio, and summer savory. After piping the cheese mixture into the blossoms (I use the super-fancy zip-top plastic bag with a corner cut off for this), I set the stuffed blossoms in the fridge for a bit to firm up before dipping them in flour, then buttermilk, then another dip in flour (a tip from our friend Derrick that gives my favorite crisp-light result). I fried them in a 2:1 mix of olive oil and grapeseed oil until crisp and golden, and instead of sprinkling flaky salt over them as they came out of the oil as I do for other fried goodies, I grated a little Pecorino Romano over the fried blossoms. I spooned the tomato reduction onto a plate and arranged my little golden flowers on top, adding a little finely chopped parsley for color and a pop of freshness. And then, I ate. And this doesn’t happen often, but I was pretty darned happy that I didn’t have to share. I say yum to that. So pretty! I love making a little sauce from cherry tomatoes. 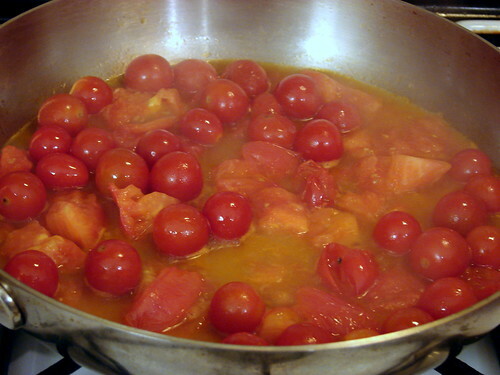 A few years ago, the NYT published a simple tomato confit recipe that I use to make a quick sauce- 2 pts cherry tom. + 2 crushed garlic + 1 rosemary sprig + some olive oil in the oven at 325 for about an hour. Smoosh through a strainer and voila. Makes the house smell intoxicating. Jen, you promised me some blossoms and you came through! They look fabulous and you make it look so easy. For the rookie here, how does one ‘clean” a blossom before stuffing? Thank you! I intend to go grab a few from the community garden and try it out and I won’t share either!!! Wow, lovely pictures and lovely stories-my favorite. Yum! 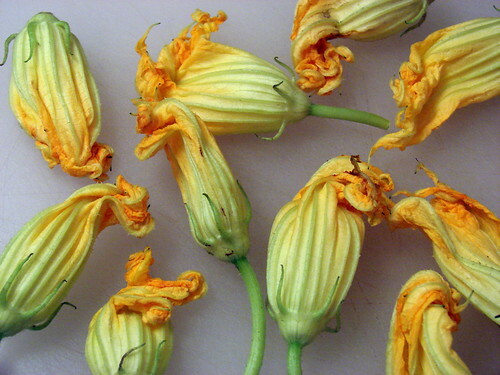 I’ve never made squash blossoms before, but it looks like it is high time to get over my fears of frying to make this. and drooling over these blossoms. Yum. 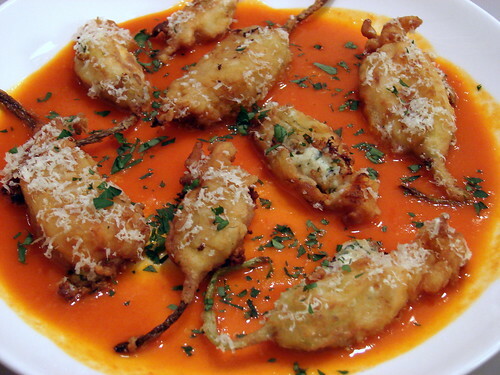 I am so jealous of those squash blossoms. When I’m home along I eat crackers and cheese, or jiffy pop. 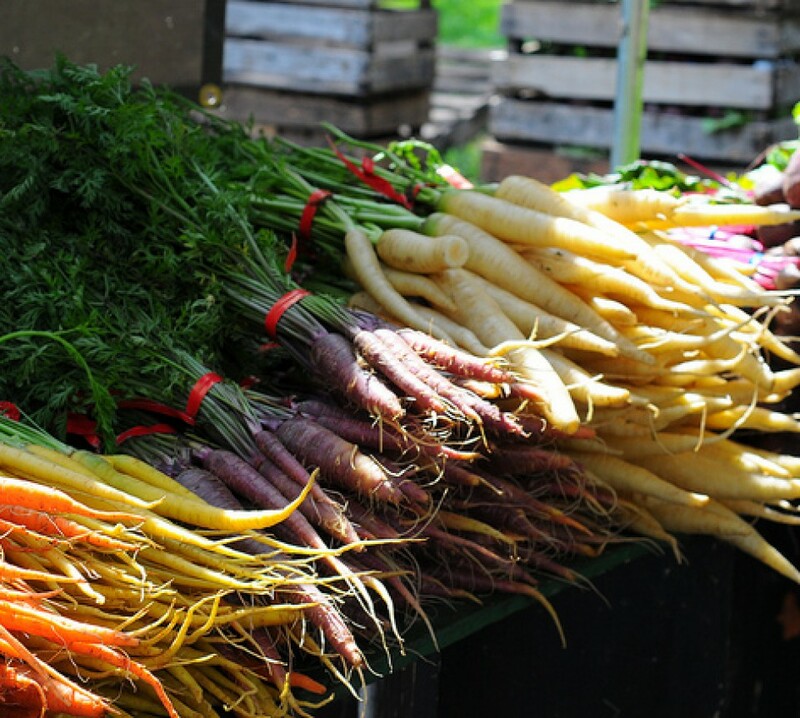 -I’m making a trip to the Providence Farmer Market this Saturday, (much bigger than the roslindale, ma one I usually frequent) can you reccomend a guide / site in case there is something I shouldn’t miss? You are so creative – I wouldn’t want to share either. Wonderful pictures, they make my mouth water. He probably knows…but tell Mike to book a lunch or dinner at Boucherie while he’s in New Orleans. I live in NOLA, and Boucherie is my new favorite restaurant–homemade everything including charcuterie and pickles, yum! Mrs W – Oh, that sounds fantastic. Sue – thanks! To clean, I gently open the blossom, shake out any little critters that might be hiding in there (I’ve had a bee once, so be careful! ), then I gently remove the stamen. I’ve found a grapefruit spoon works perfectly! maggie – thank you, sweetie! Elle – check out the Farm Fresh RI website (http://www.farmfreshri.org/), and if you see me, please say hello! Debbie – thanks so much! Patricia – I’ve forwarded your message to him, and he says thanks! It’s Molly Sullivan – wanted to come to your site and check out some of your recipes. Everything is so gorgeous – my mouth is watering. I’m going to try your tomato reduction tomorrow. Do you take all your own photographs as well? Amazing.